Pack it for lunch. The roti will not get soggy as it is a dry sabji. You can prepare the same recipe with other dry sabjis. Check out my long list of more than 80 side dishes for chapati for more dry sabzi recipes. Note -You can skip green chillies, if it is for kids lunch box. 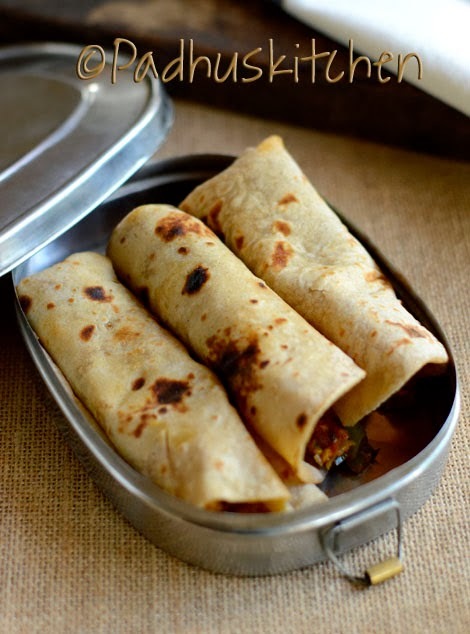 Try lunch ideas given below and I am sure your kids lunch box will come home empty. If you have more interesting ideas, so share it in the comment section of this post. A very healthy lunch box recipe. Delicious rolls !looks so yummy .. I tried the recipe , it turned well. thank you for sharing the recipe. I made it just now for dinner. My dad (who's my biggest critic) had 4 chapatis instead of his usual 3 :D Was yummy! Thanks for the recipe. I'm a fan of yours! Awesome recipe. I love chapatis this way. Thanks a lot and I look forward to more of your yummy recipes to fill my tummy. Thanks Padhu. My husband always appreciates the taste of food when I follow your recipes. That gives me immense pleasure. You rock Padhu!!!! 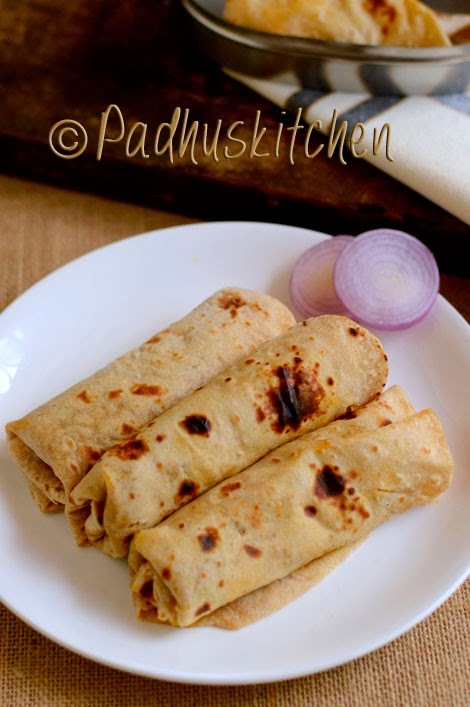 can you please tell how to wrap the rotis ..at the end..the way you have done ..
First keep the stuffing in the center vertically leaving gap on the top and bottom. Fold the bottom and then roll it. That's it. Can we use baby corn instead of panner??? Can we add cheese to this stuffing? if yes then when exactly to add? Yes, you can add after turning the heat off for the sabji, when the sabji is a little warm. In that case, you can avoid paneer.